When does this karma comes upon these robbers? Consider this, why is it that whites are relaxing at the beauty spot? And gave us dry bones? The tall story goes on. . .
Let’s vote for the black Verwoerds’ and Malans’re incarnated. I only have poetry to spout! so envision what’s missing. . .
Unathi Slasha under the nom de plume ‘Dark-blood the bard’ is a spoken word artist, performer, literature enthusiast, poet, short story writer born in 1989, emerging from a small township named Dispatch in the Nelson Mandela Bay, infamous of its extremely high rate of illiteracy and dearth of artistic activism. A glimmer of hope carried out by this well-read young man determined to be a positive model and a trendsetter among his peers and set a perfect example for the up-and-coming young people in his community through performance art, with an undisputed aptitude. His love for performance poetry commenced when he got introduced to poetry sessions by a friend who was a poet. From there, he got influenced and imbued with passion to start writing. He consistently contains an influential and enticing manipulation of words, with a flawless poetry and a unique phraseology and diction. On stage he is known for his spirited and energetic delivery and controversial style that comes out as a blend of street style yet literary poetry that involves socio political issues and historic events that tend to take any audience aback.His love for African literature is evidenced by the allusions and complex metaphors and intertextuality prevalent in most of his poetry – spoken word. He aims at using his writings as an apparatus to inform and to instigate social reforms: to individuals who wish to be products of change in the society at large: he creates a personal pressure that frog-march them to do research about their identities and roots. Since he commenced his journey of performances and circulation around the different parts of the Eastern Cape, KZN and in the Western Cape, he has been receiving respect and love from each and every single person that has witnessed his pure talent and energy on stage. One of his short stories and a few of his analytical poems have been published in an annual literary Journal called Ntinga, and as well as in the publication called Expressions within both of these publications were/are initiatives of arts and culture and the Nelson Mandela Metropolitan University’s department of language and literature. During the operation of the 2013 Africa Cup of Nations, when some of the matches where held in PE, he was one of the performers that kept the crowd intrigued with his revolutionary and unconventional poetry at the PE Opera House theatre. He has performed in East London at one of the most prominent platforms known as the Soul Clap Sessions organized and hosted by Ipoetry KaNkqo. The Bard was one of the indelible artists that had an outstanding theatrical performance at the annual Grassroots Arts Festival held in Motherwell. He was one of the four first PE artists to make an appearance in the yearly Hip-hop event – The Final Touchdown in Alice. The bard has performed as a guest poet at the Love Life Music is Life mini Festival that was held In Uitenhage at Willow Dam in 2013. In 2012 he was one of the poets that were chosen to facilitate and demonstrate spoken word to high school pupils during the poetry workshops that were held in September during the National Book week at the Red Location Museum in New Brighton. The Bard has performed at the 2013 Nelson Mandela Bay Book fair that had the likes of Ntsiki Mazwai, Don Mattera, Lesego Rampolokeng, Niq Mhlongo, Motsoko Pheko, Ayanda Billie and other remarkable renowned authors and poets. 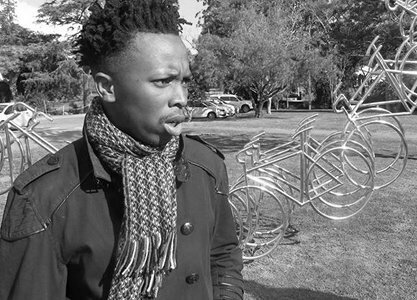 He has also co-founded NMMU’s foremost spoken word and poetry society called the Resonance Poetry Movement, along with Sisonke Papu and Azola Dayile – which they have successfully managed to launch. He has also worked with the NMMU International Office and the Centre for the Advancement of non-Racialism and Democracy (CANRAD) in the NMMU Africa Week in a public lecture delivered by Prof. James Ogude (University of Pretoria) in remembrance of the late Chinua Achebe and his impact on the African literature landscape. He has been featured as a one of the performers at the first ever two days poetry festival in the Nelson Mandela Bay: Praat Poetry Festival, which hosted Lebo Mashile and Lesego Rampolokeng as guest poets. Every single person who claims to love poetry and is an art enthusiast is obliged to show respect to the craft of this young wordsmith as he continues to make major moves. He believes to be the embodiment and the rhetorical speaker for the neglected poor through his spoken word that he enthusiastically utters.